The Holy Synod of the Serbian Orthodox Church has issued a statement in regards to the arbitrary, and in the eyes of the Church, illegal visit of the monk Artemije to certain Serbian communities in the United States of America. The intrusive announcement of the visit of the monk Artemije has no blessing of the Serbian Patriarch, nor any local bishop of the Serbian Orthodox Church in North and South America, nor any organization or individual in our Church. The monk in question, once bishop of Ras and Prizren, has been defrocked of his episcopal rank through a canonical hearing of the Holy Assembly of Bishops of the Serbian Orthodox Church, and the charges against him, which are of a material-financial nature, are the subject of criminal proceedings before the judicial bodies of Serbia. Recently, this misled, spiritually deluded leader of a parasynagogue, an illegal community which has no blessing and is not recognized by the Church, has taken efforts to create a schism, with all the consequences which result from the same, particularly in our tragic times, in which many evil forces from all sides, both within and outside, are tearing at the Serbian Orthodox Church, its reputation, canonical order, unity and mission. His “visit” to the Serbs in America serves to transform his parasynagogue into a true schism. His anti-American rhetoric of today – more deceitful than his once pro-American and NATO rhetoric of before – does not change the fact that he, who was in fact a favorite of Albright, Holbrooke and other Serbian “benefactors” in the US, in contrast to nearly all other Serbs has a permanent visa for entrance into the US. The traitor has remained a traitor – except that in the meantime he has evolved from being a false zealot and false patriot into a true destroyer of church harmony and Serbian unity. Being as this defrocked bishop in his spiritual pride brings confusion to the uninformed and scandalizes the gullible, we consider it our pastoral duty to point out to the faithful people some basic facts. What should one say regarding all this nonsense? 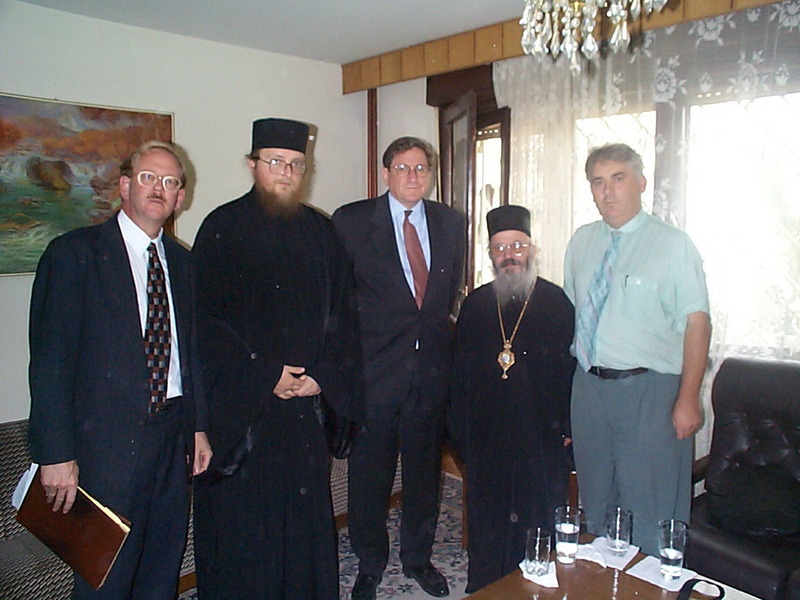 In the Serbian Orthodox Church there is no persecution, especially not in the case of the monk Artemije. There is only his canonical and criminal accountability, as well as the accountability of his co-participants, for the unheard-of theft of monies intended for the suffering Serbian people in Kosovo and Metohija. That money came not only from government institutions in Belgrade and not only from the impoverished Serbian people in Serbia, Republika Srpska, Montenegro and other places, but a great part of it also came from Serbs faithful to both God and their people who live throughout the world, much of it coming from the very Serbs living on the American continent. We invite all of you, dear brothers and sisters, who gave or sent Artemije your hard earned money to consider the question: why did you never receive information or documentation regarding how your donation was used? Consider the luxury which was purchased for the false ascetic and his pseudomonastics! There is also the proven canonical charge against him of destroying the ancient order of the Church, refusing to be obedient to the highest hierarchical body of the Serbian Orthodox Church - the Holy Assembly of Bishops - as well as inciting the gullible to rebellion and disrespecting the aforementioned bodies. At first he and his propagandists with guilty consciences said that the new Serbian Patriarch is good (we believe how they dealt with Patriarch Pavle of blessed repose is not unknown to you), but that Artemije's episcopal brothers who shared the same spiritual father, as well as some other “key bishops”, are bad, and so they appealed to the Synod; afterward they claimed that the Synod was unjust to them and that the judgment of the Assembly of Bishops would be the only authoritative one; finally, when the Assembly did not play to the tune of Artemije's sect, they proclaimed that the Assembly does not know what it is doing. Artemije's incorrect understanding of the Church can be summed up in the sentence: “The Church is me!” His supporters go even further, blaspheming the Holy Spirit, when they claim: “There is only one truth – Bishop Artemije” (!). Furthermore, there is no heresy in our local Church. Artemije’s slanderers insolently throw out talk about “heresy” and in so doing show that they are doing the devil’s work (the word devil in translation means, among other things, slanderer). To slander the Church and its legitimate archpastors, headed by their primate, means to put oneself outside the Church. Have not all heretics done this throughout the history of Christianity? Let the pseudo-zealots and false devotees look for heresy not in the Church of the Living God, which is the Pillar and Ground of Truth, but rather in their own, after all freely chosen false “exile,” and in their luxurious “catacombs”! In our church and national midst there exists no kind of “uniatism.” Communal life in pluralistic circumstances and cooperation with non-Orthodox Christians on various questions of common interest have absolutely nothing to do with “uniatism.” And, brothers and sisters, you here in America live your entire lives in everyday contact with non-Orthodox Christians — in your circle of friends, at work, and even often in your own families — but nonetheless you have not “become uniates.” What does unfortunately exist, and what our Church has often protested, is the unhealthy atmosphere of pressure on the Serbian people in Croatia who, in some places more and in some places less, live under the constant threats of the resurrected vampire-like ustashe, because of which some Serbs of little faith and small souls decide to convert, whether out of fear or out of self-interest. But no one in our Church is responsible for this phenomenon: the guilt falls only upon those who abandon their ancestral faith, forgetting the example of Matavuljev Pilipende, and on those Roman Catholic priests in Croatia who “baptize” them, undoing the teaching and instructions of the Second Vatican Council, which they nonetheless hypocritically profess. The accusations of “ecumenism” are likewise the result of a lack of understanding of the mission of Christ’s Church by Artemije and the Artemejists. This lack of understanding emerges , on one hand, from the muddy spring of obscurantist fanaticism and a sectarian understanding of the Church’s nature, and on the other hand from political and ideological motivations. Now Artemije proclaims every meeting and dialogue to be “ecumenism” and treason to Orthodoxy, even though he, necessarily and properly, met with both non-Orthodox and non-Christians more and more frequently than all the other Serbian bishops combined. After all, the Orthodox Church is by her nature universal and all-encompassing, and therefore has a universal, planetary responsibility to preach the Gospel of salvation to every creature and to illumine all peoples with the teachings of Christ. The words ecumene and ecumenical, of Greek origin, in translation into Serbian really mean vaseljena (universe) and vaseljenski (universal). From this the general councils of the Church are called Ecumenical Councils, and the greatest holy Fathers — such as St. Maximus the Confessor, St. Gregory Palamas and St. Mark of Ephesus, and most recently amongst us St. Bishop Nicholai and St. Justin of Celije — are called ecumenical teachers. Besides the one-sided Roman Catholic and Protestant versions of ecumenism, there exists an authentic Orthodox understanding, which the Holy Elder Justin in his Notes on Ecumenism, published in 2010 by Monastery Tvrdos, defines as divine-human ecumenism. So, it is not treason nor a sin to witness to the Orthodox Faith before other Christians and before people in general, whether in the context of institutional and official dialog, or spontaneously and informally; sin and treason exists only when we witness to the hope which is within us unfaithfully or unworthily, or when we do not witness at all because we reject every encounter and dialog, which is the existential core of the anti-universal, anti-evangelical, anti-ecumenical and anti-church position of the Aremijite sect. Finally, “the neglect of Svetosavlje” in our Church is noticed only by those people who are spiritually blind due to their – in essence godless – understanding of nation. They are the ones who have forgotten the wise words of Bishop Nikolai that for the Church there is no difference between the godless internationalist and the godless nationalist. Svetosavlje is not an ideological tale told by people who have no church consciousness and conscience for others, the same kind of people; rather, it is faith and life according to the example and measure of Saint Sava. Svetosavlje is nothing more than Orthodoxy according to the Serbian style and experience, as Abba Justin of Chelije teaches us. It is particularly tragi-comical that a man who has created a schism in the Serbian Orthodox Church is speaking of Svetosavlje. With a group of some ten arrogant defrocked monastics and former nuns, fugitives and deserters from the Serbian holy sites in Kosovo and Metohija, who concerned themselves not with the people but with their own comfort, he destroys that which St. Sava built and tears down that which St. Sava summoned to unity. We advise the organizers of the visit of their guest, whom the Church considers an uninvited guest, that with their actions they are contributing neither to the peace nor the unity of Svetosavlje in our martyred Church, nor to the unity of Holy Orthodoxy. On the contrary, with the unfounded politicization of the case of the defrocked bishop and the propagating of his defamatory views they act in an un-Svetosavlje and un-Orthodox manner, to the damage and shame of Serbdom, and to the joy of her enemies. 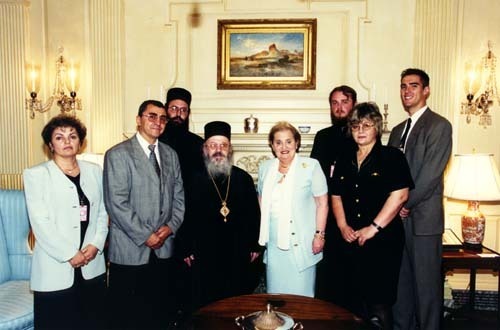 All Orthodox patriarchates and autocephalous Churches have made official statements recognizing Artemije's defrockment as canonically conducted and not one is in communion with him. Subsequently, those who recognize him and receive him place themselves above all Orthodox Churches in the world, thereby showing that they too are infected with the virus of the schismatic mentality. 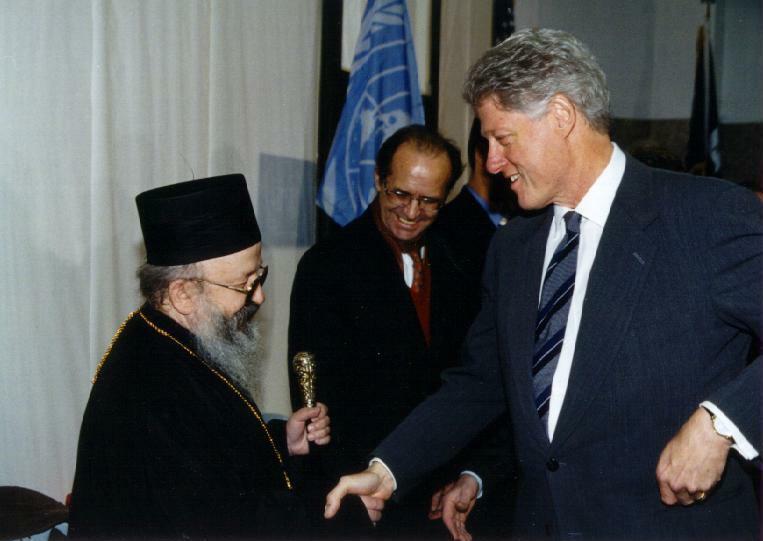 The monk Artemije, the so-called protector of Kosovo and Metohija from the Euro-American occupation, - whom he, at one time, greeted and praised as “liberators” - has come to America for the who knows how many time. He demonstrates the advantages of one who has a permanent visa and attempts to transplant his parasynagogue on American soil, but this is not his main goal. His main goal are the banquets at which he is to collect free will offerings, but not for Serbian holy sites and the impoverished Serbian people of Kosovo and Metohija but for himself and his schismatic company in the non-existent “exile”. He who has no scruples, let him freely finance him! His sometime “lobbying for Kosovo” was nothing but the squandering of your money and the money of poor people, and even now he no doubt has plenty in his private bank accounts in Serbia, Greece and Switzerland. To the request of the Holy Synod that he give a report of his accounts, he officially responded that he is a citizen just like any other citizen and that the Synod has no right to intrude into his “privacy”. A truly spiritual response, a response true to Svestosavlje, no doubt about it! He sued His Eminence Metropolitan Amphilohije and His Grace Bishop Atanasije for defamation in the civil courts when they disclosed information about the stealing of the Church's and people's money, and yet this was only a fraction of the information which is now in the possession of the prosecutor in Belgrade. Brothers and sisters! Keep an eye out for the days are evil, while our accountability before God, before the Church of God, before the Serbian people and our own consciousness – is great, very great, hardly conceivable. 1. Artemije as a “defender against heresy, ecumenism and the Uniate”. 2. Artemije as a “defender of Kosovo and Metohija”, as he “is the only one who does not recognize the self-proclamation of the Albanian government” (but he did not hesitate to shake hands and sit at the same table with Hashim Thaci called the Snake, who boasts of how many Serbs he killed with his own hands. 3. Artemije as the “fighter against globalization, American neo-imperialism and Euro-American occupation of Kosovo and Metohija”. We note that meetings and discussions with heterodox and heterodox religious leaders, as well as statesmen and politicians, even with aggressors, shouldn't be understood, by themselves, as a betrayal nor defeatism. The problem is not that Artemije spoke with and cooperated with this or that person, including some suspicious individuals from the enclosed photographs, but in the fact that he and his sect wisely keeps this side of their activities quiet, as they keep silent about how much money they have received from the World Council of Churches or other various Roman Catholic and Protestant institutions, while at the same time they pharisaically condemn and devilshly slander Orthodox bishops, from vicar bishops to the Ecumenical Patriarch, because of their meetings and dialogue. This is, truly, the essence, the sophisticated use of a double standard. Evangelically speaking, this is pharisaism.